Tim Palmer, author and photographer of OSU Press's new book, Rivers of Oregon, joins us today to share a brief interlude from his time exploring Oregon's Willamette River. Rivers of Oregon contains beautiful photos of the scenery on and around Oregon Rivers -- both east and west. The photographs allow readers to look beyond themelves and into the landscape they inhabit. How has the landscape changed? What have we done with it? What has become of the vastly wild and beautiful land that was here before us? In today's blog post, Palmer provides vivid imagery, helping the reader to see what he saw and to feel what he felt on his journey down the Willamette. As I paddled down the Willamette, with its western shore ramping up toward the Coast Range and its eastern bank climbing toward the higher Cascade Mountains, I thought of this river as the metaphorical keel of Oregon- a balancing feature that all the rest depends upon. Without the Willamette's watery path headed northward- along with the valley it shaped and the runoff it delivers- few people would ever have settled in the most populated corridor of Oregon. Portland wouldn't be there. I knew also that the Willamette was the supply line on which salmon, birds, beavers, and hundreds of other creatures depend. More whimsically, and more personally from my own cherished experience, the Willamette is the Huck Finn river of the Northwest. Its riffling current made it possible for me to set out on a revealing expedition of two weeks, traveling 189 miles from upper reaches down to tidewater. My fluid route and ticketless transit touched cities, farms, and wild remnants of the original Oregon in a way that brought all these elements together into a sojourn that -- though tame relative to other wild rivers nearby -- was spiced with adventure and discovery. I had to be alert to the swirls and boils, to currents and headwinds, to seductive back channels that drew me to explore but could serve me up to logjams or wooded swamps with no pleasant way out. But lacking steep drops -- except notably for the largest cataract in the West at the upstream edge of Portland -- the Willamette drifts at a gentle pace that's suited to many people in canoes or other craft. It invites us on a quintessential "beaver-state" outing. In my unbridled fantasies about education, paddling the length of the Willamette would be a coming-of-age ritual for every boy and girl in Oregon. The Willamette has been affected by two centuries of efforts to tame and subdue an awesome and primordial force that's inherent in the simple conveyance of water from source to sea. But a certain magic remains, and I felt it in every view of the river bending in front of me, in the rise of great cottonwood trees at the shoreline, and even in the dark of the night. Lingering on a spacious gravel bar at my second campsite where cold undertows of the McKenzie River joined the larger flow, I watched stars fall into a navy-blue sky. Then moonlight streaked the river in white while the curent bubled its song to my ears. From the top of a cottonwood, a great blue heron -- aroused by some mystery in the dark -- squawked like a bird-call from the beginnings of time. A great horned owl resonantly hooted from a roost deeper in the floodplain forest, telling me that this place was his. A beaver, inexplicably aware of my presence though I hadn't moved a muscle, smacked its tail on the water's surface and dove to swim underwater as it passed. 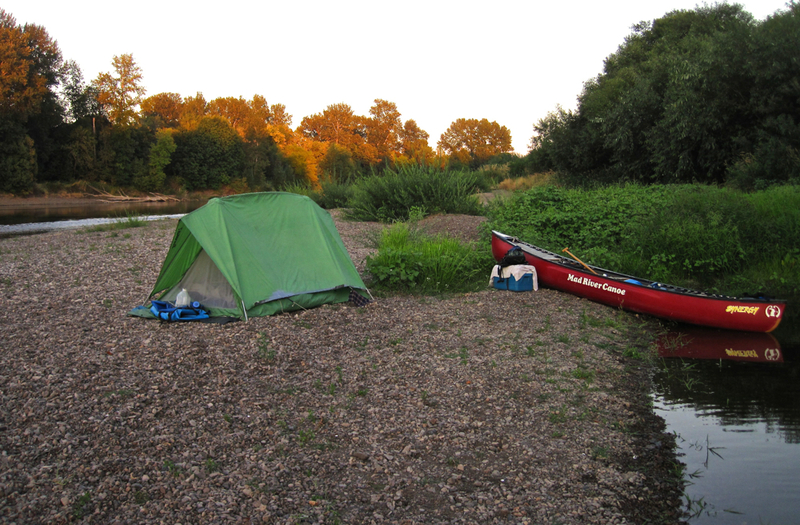 There on the Willamette, just a few miles from Eugene, my world was reset to the milllennia of days, nights, seasons, floods, droughts, and deep passages of time as the river has carved its course and as life has evolved in the watery depths and along the shores. The river took me back to a universe that's lasting and real. In setting out on a paddling adventure to a place I had never been, I felt like I had come home. And I also felt that my home had grown much larger. The river opened the door to new acquaintances with everything that lay downstream. Each day I drifted farther. I enjoyed both solace and excitement from the rhythms of river-life: sunrise followed by high noon and then sunset, morning calms followed by afternoon winds, pools followed by rifles, over and over in what hydrologists call the pool-and-riffle sequence. Each evening I took my camera in hand to capture sunset's glow on animated currents. Every night a big dome of stars and cottonwood limbs arced overtop my camp. Every morning in the tender light of dawn I watched for the wake of an otter or mink, the whistling flight of a merganser or wood duck , the dive of a kingfisher, osprey, or eagle. 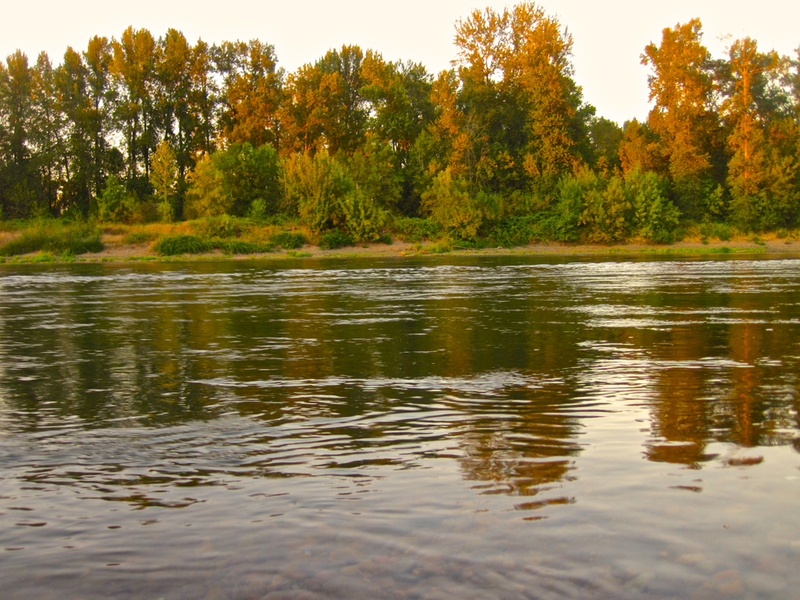 The Willamette is the largest stream flowing wholly within Oregon, but it's just one of hundreds, each with its own purpose and path, its own charm and appeal, its own intrinsic worth. 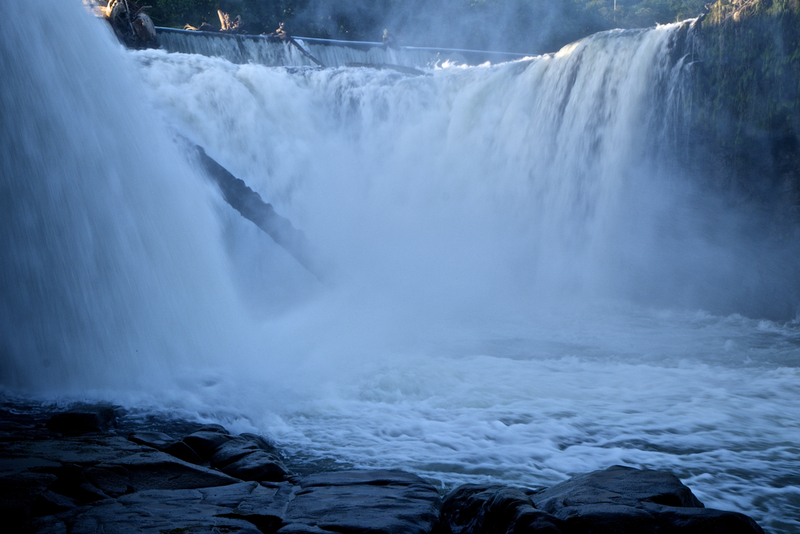 I wanted to see them all, and so I set out to write and photograph Rivers of Oregon. 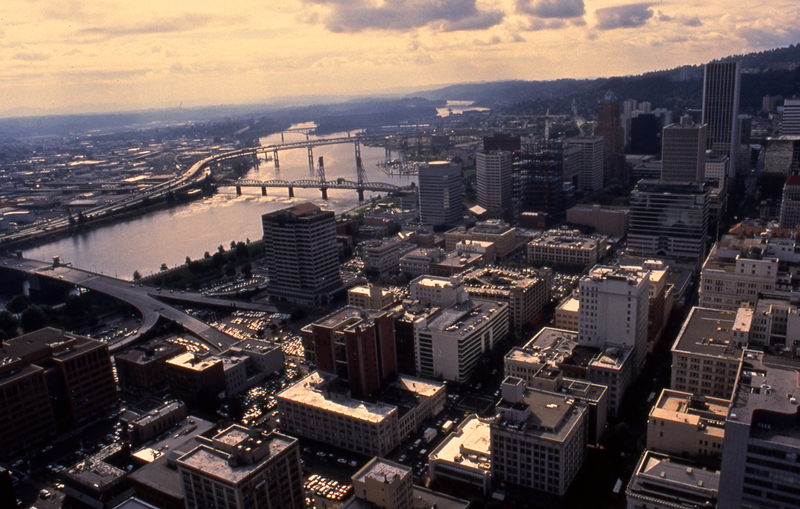 Today, Dr. Ellen Eisenberg will share an excerpt from Chapter Six in her new book, The Jewish Oregon Story, 1950-2010. Religion may not be the first thing a person thinks of when they think about Oregon. However, Dr. Eisenberg has provided an eye-opening, thought-provoking book, allowing readers to delve into the history of Judaism in Oregon and how Jewish identity has been affected by the progressive ideas in this ever-changing state. Before diving into this Chapter Six excerpt, Dr. Eisenberg shares some of her inspiration for the chapter, as well as giving a brief view behind this particular anecdote. From the moment I began thinking about a book on recent Oregon Jewish history, I imagined a chapter on “Jewish Portlandia.” Inspired by my own impressions of differences between the East Coast Jewish communities I was raised in and those I’ve encountered in Oregon, I wanted to explore what is distinctive about local Jewish culture and identity. How does the Oregon Jewish community reflect, embrace, and shape the state’s image as a trendy, progressive, innovative, quirky center? If the Pacific Northwest is the “none zone,” the part of the country where residents are most likely to check “none of the above” when asked about their religious affiliation and where they are more likely to identify as spiritual than religious, how does that affect local Jewish communities? How do regional sensibilities about politics, style, food and sustainability impact Jewish identity? Drawing on archival sources as well as current expressions of communal identity through websites, public programming, and institutional innovation, Chapter Six explores the connections between contemporary Jewish communities and twenty-first century Oregon sensibilities. It opens with the story of Mayan Miriam, a mikvah (Jewish ritual bath), used traditionally for purification prior to conversion or marriage, and, monthly, by women to mark their transition back to a pure state in which marital relations are permitted. The mikvah, housed in a yurt in a backyard in Eugene, is an apt symbol of twenty-first century Judaism in Oregon, with its embrace of place, innovation, environmentalism, inclusion, spirituality, and do-it-yourself ethos. In 1968, after visiting a variety of synagogues to explore different streams of Jewish life, Libby and her young son moved into the House of Love and Prayer in San Francisco. Founded by Rabbi Shlomo Carlebach, who would later become a major figure in the Jewish Renewal movement, the House of Love and Prayer was known as a “Jewish hippie commune,” which was, in Libby’s words, “both Shomer Shabbat [Sabbath observing] and a source of certain mind-altering substances.”5 There she met Rabbi Zalman Schachter-Shalomi, the founder of Renewal Judaism, and Aryeh Hirschfield, who became a major figure in Eugene Jewish life in the 1970s and early 1980s. After his ordination, Rabbi Hirschfield served Renewal congregations in Ashland (Havurah Shir Hadash, 1985–1995) and Portland (P’nai Or, 1996–2009).6 It was during her time at the House of Love and Prayer that Libby began regular visits to the mikvah in San Francisco’s Mission District. After moving from San Francisco to Corvallis, Libby met and married her second husband, Joseph Bottero, also a convert to Judaism, and became involved in the community, first at Beit Am in Corvallis, and then at Temple Beth Israel in Eugene. Relocating to Eugene, the Botteros began thinking seriously about building a mikvah. For women such as Libby, who found deep meaning in the monthly ritual of immersion, the only options at the time were to drive the four-hour round-trip to the mikvah in Portland, or to immerse in a natural body of water, such as the Willamette River. For much of the year, the latter was an uncomfortable and unsafe option. The Botteros first established a natural pond mikvah in their Eugene backyard, but soon began talking about building a more lasting structure. Inspiration came from Rabbis Carlebach, Schachter-Shalomi, and Myron Kinberg of Eugene’s Temple Beth Israel, as well as from The Jewish Catalog, a 1960s-era popular guide that “encourage[d] ordinary Jews to be empowered with the knowledge to do mitzvoth,” such as hanging a mezuzah or building a sukkah. When it became clear that Beth Israel was not going to incorporate a mikvah in its plan for a new synagogue building in the early years of the twentyfirst century, the Botteros moved toward fulfilling their long-held dream. Eisenberg, Ellen. "Chapter Six: The Jewish Oregon Story." The Jewish Oregon Story, 1950-2010. Corvallis: Oregon State UP, 2016. 208-10. Print.